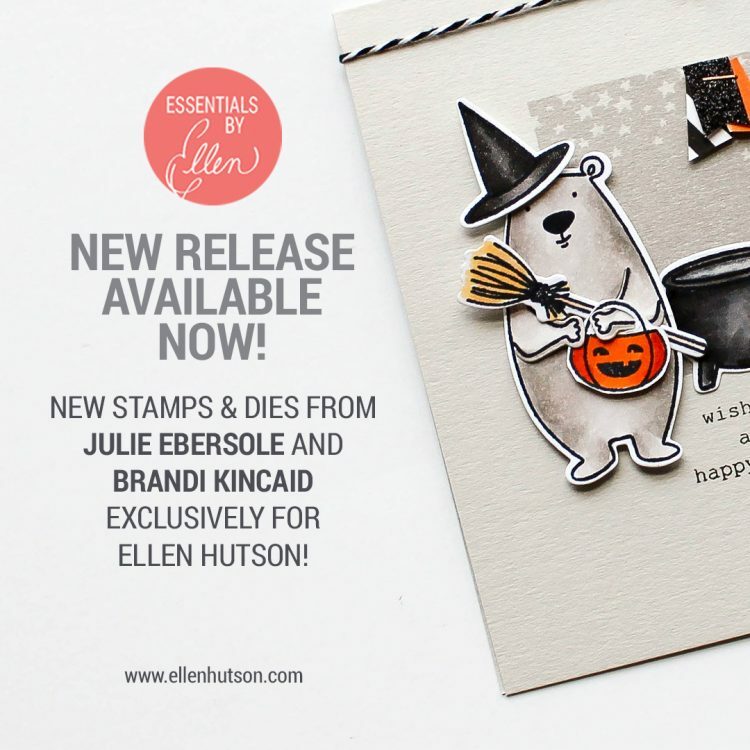 Hello there and welcome to my stop on the Essentials by Ellen September release hop! I’m so glad you’re here! I was super excited to be asked to participate in the hop, even before I saw the release! Julie, Brandi and Ellen are all among my favorite humans and I’m so lucky to call them friends. I just knew they’d cook up something good, and oh man they sure did! I was sent the whole release (!!!!) and asked to focus on the Concertina Tag. 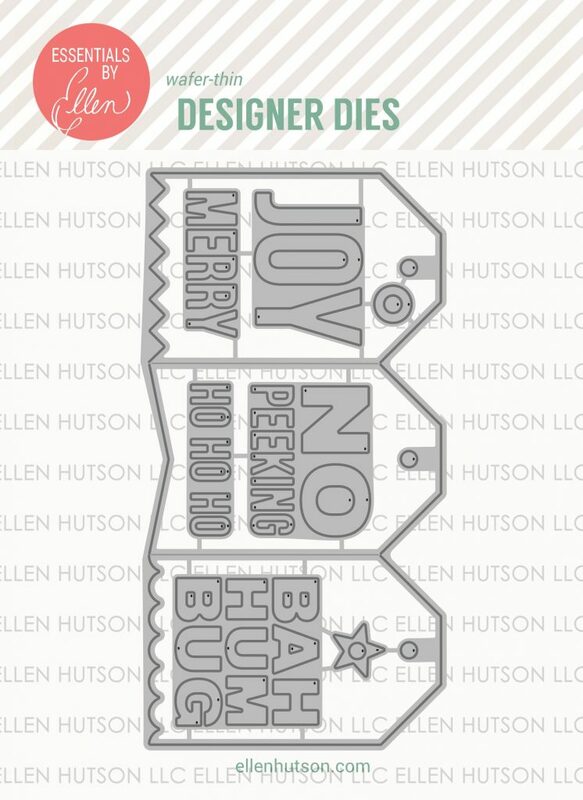 The main tag die cuts out the tag shape and then scores it so you can fold ’em up accordion style. 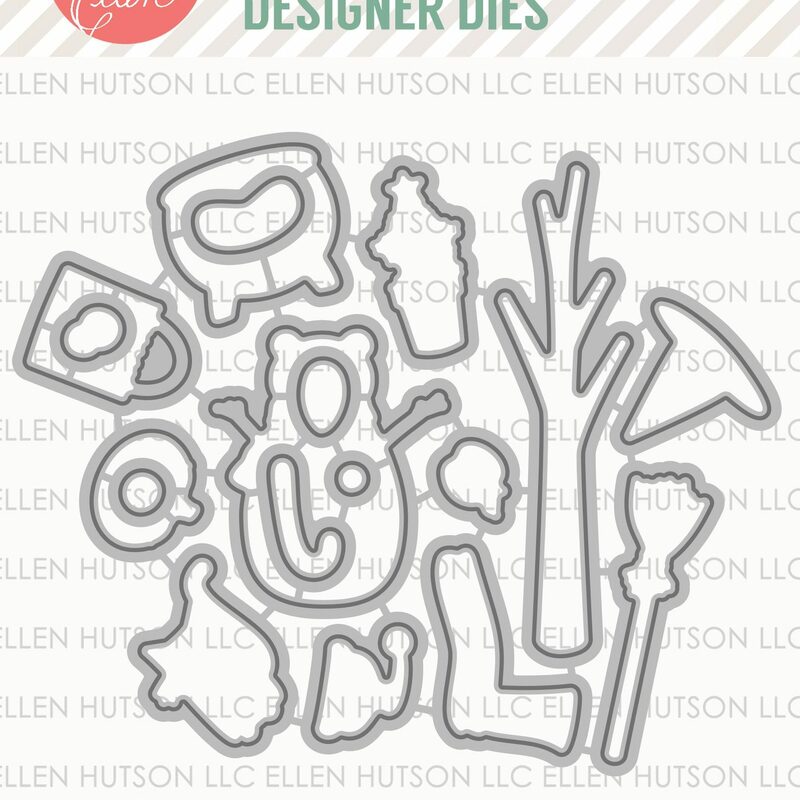 Besides the obvious tag shape, you could use this to make a mini gatefold card or even glue some together and make a mini book! 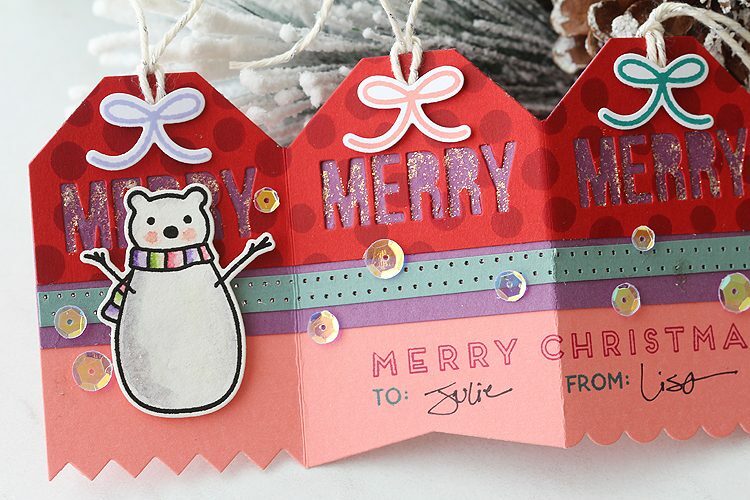 It comes with that star and circle so you can put them over the holes in the tags — so classy! 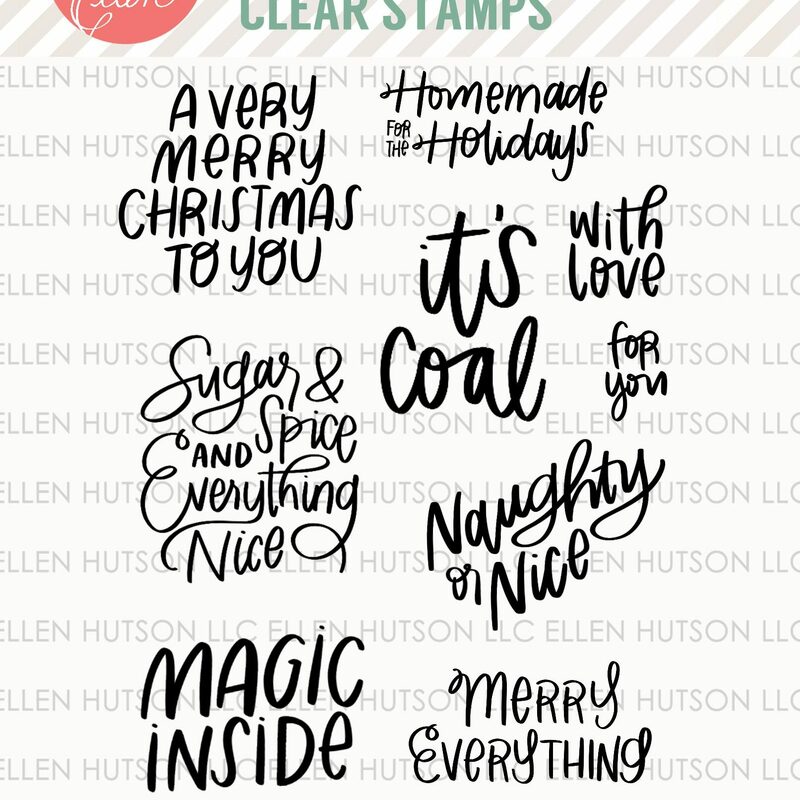 I was having way too much fun and got a little carried away — I ended up making FOUR tags — plus I’ve got some more remnants to play with later! Now let me walk ya through ’em! First off, I wanted to tell you about my color scheme. 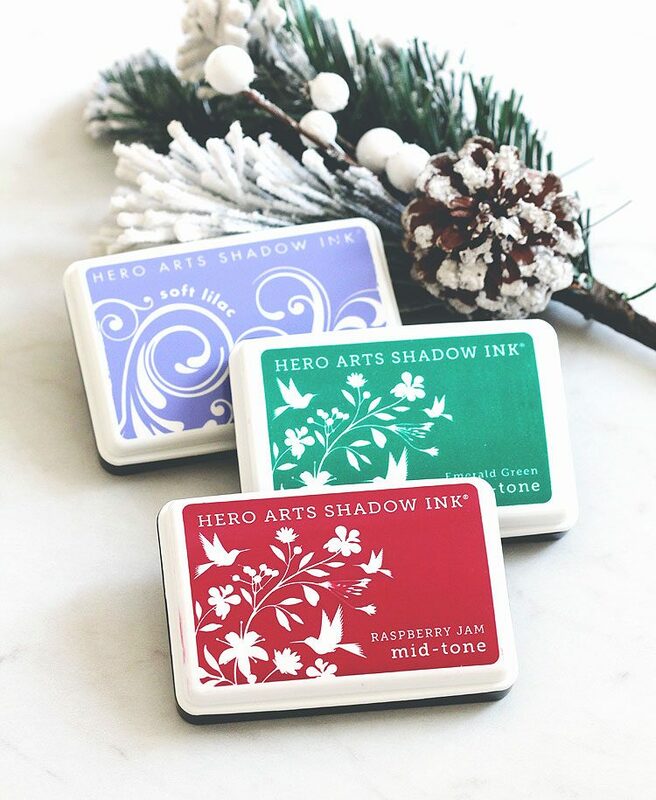 You see, I love love love the Modern Christmas stamps and dies in this release, so I just had to go with a “modern” color scheme to go with them! 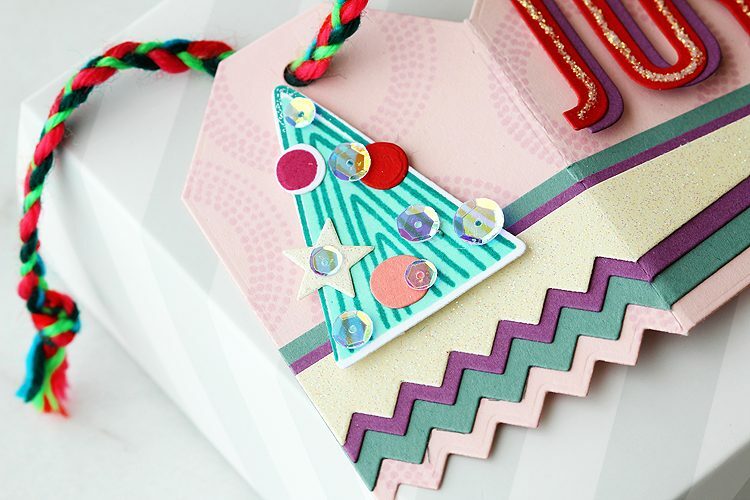 My favorite way to break in a new die like the Concertina Tag is to jump right in and cut it out of a bunch of different colors of cardstock — that way I have plenty to work with! So that’s what I did here. As I was cutting them out I had an idea! 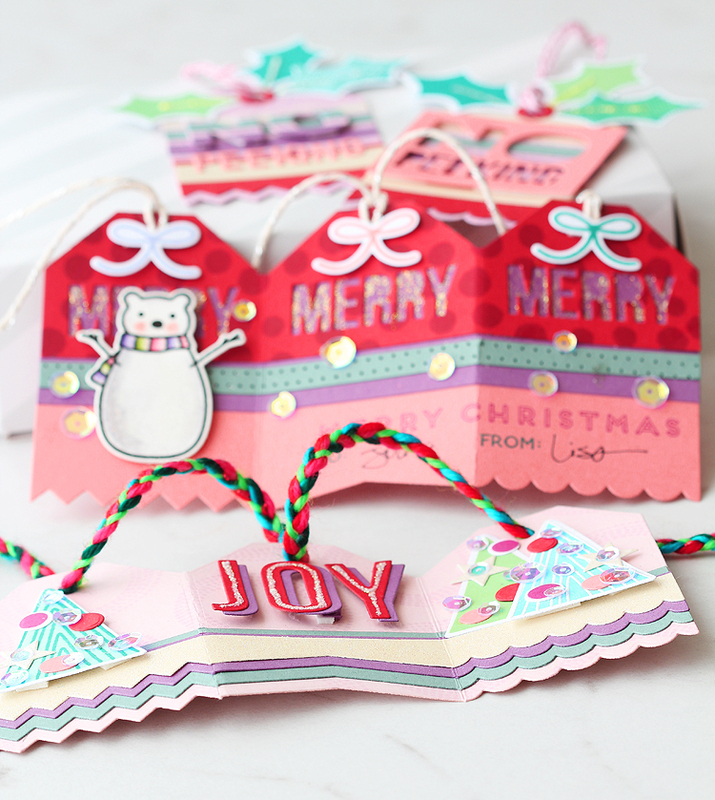 I cut strips out of a bunch of different tags that I’d cut out and layered them over each other — so cool! Just line them up and you’re good to go! I added some trees from the Modern Christmas stamp set, and blinged them up with star ornaments cut from glitter paper. Now, the stars actually have a hole in the middle so that you can use ’em over the holes in the tags. Buuuuut, I decided to put Magic Sequins in the middle to hide the hole. Double bling for the win! Just had to add that those Hero Arts mid tone inks work so great when stamping solid images like this. You get such nice, even coverage. 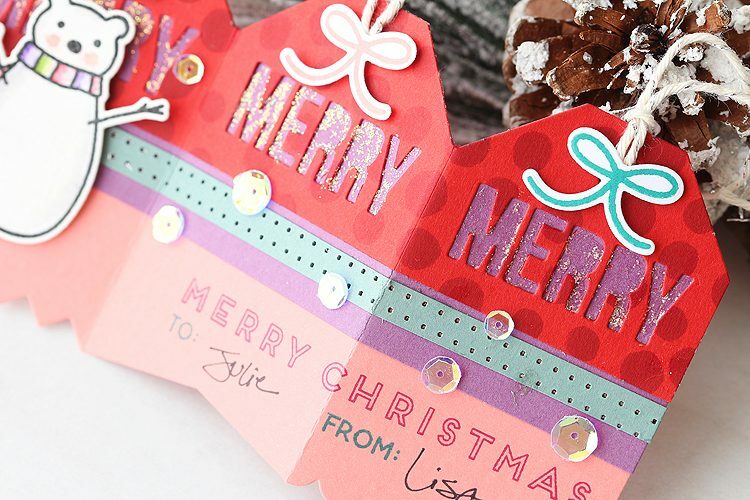 I started out by stamping a tag cut from red cardstock with the dots from the Modern Christmas set in raspberry jam ink, then I cut it about a third of the way down from the top. 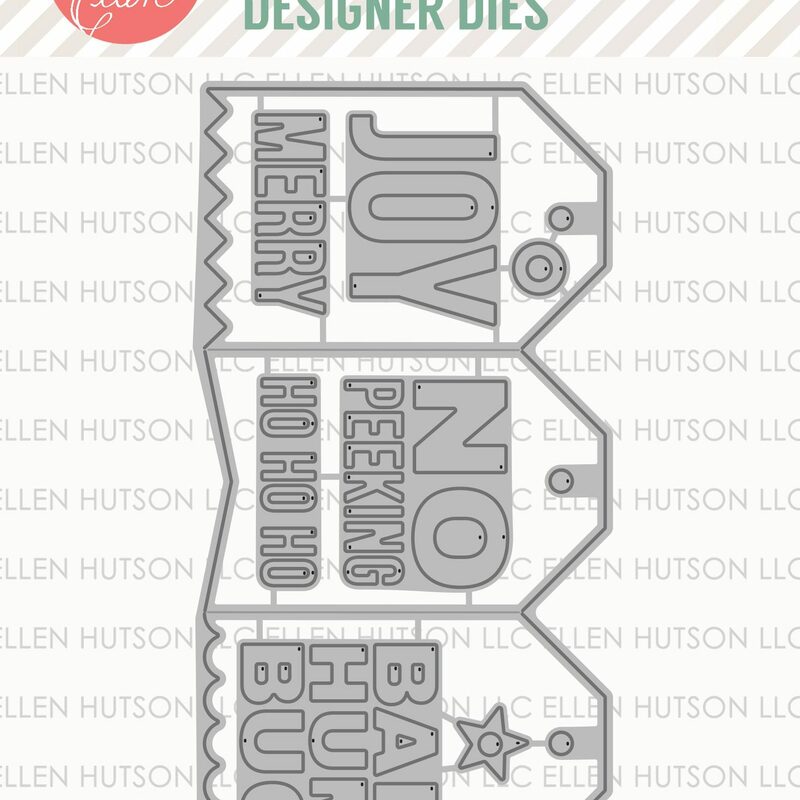 Next I die cut the “MERRY” word that’s in the Concertina Tag set from that three times, and then layered it over a purple tag strip, and then BOTH of these layers were adhered to a full pink tag! Then, I just had to add the little snow bear from the Bear Wares 2 set! Ahhhh it’s so cute! I cut him out with the matching Bear Wares 2 dies — love having matching dies when it comes to cutting out arms and things like this. Added more glitter to him, too! 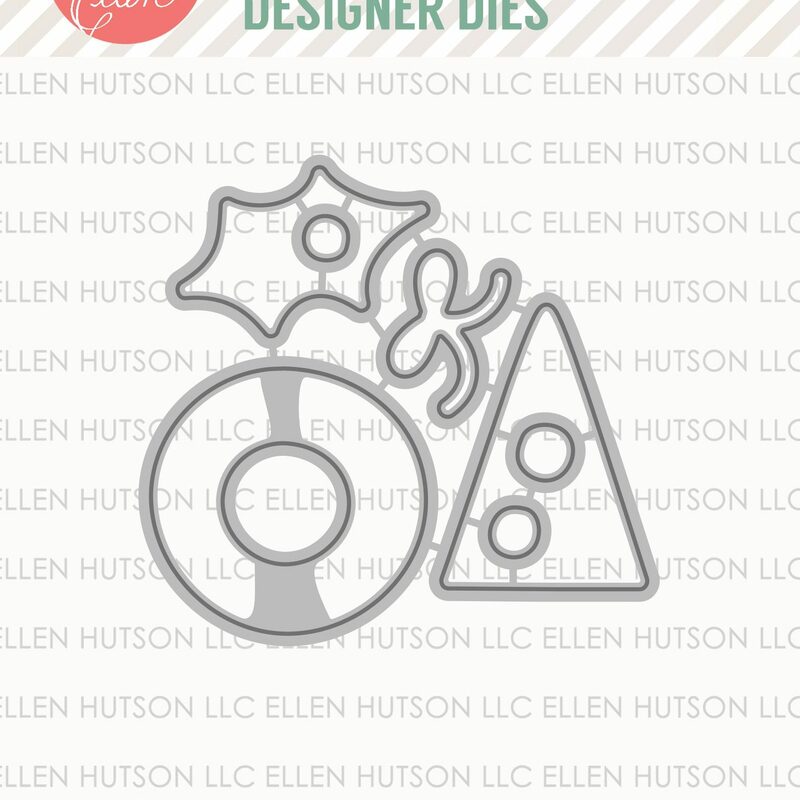 I finished up the card with some lil bows from the Modern Christmas set, and cut ’em out with the Modern Christmas dies. Then I added a few Like Magic sequins and that was that! Now for my last 2 tags! 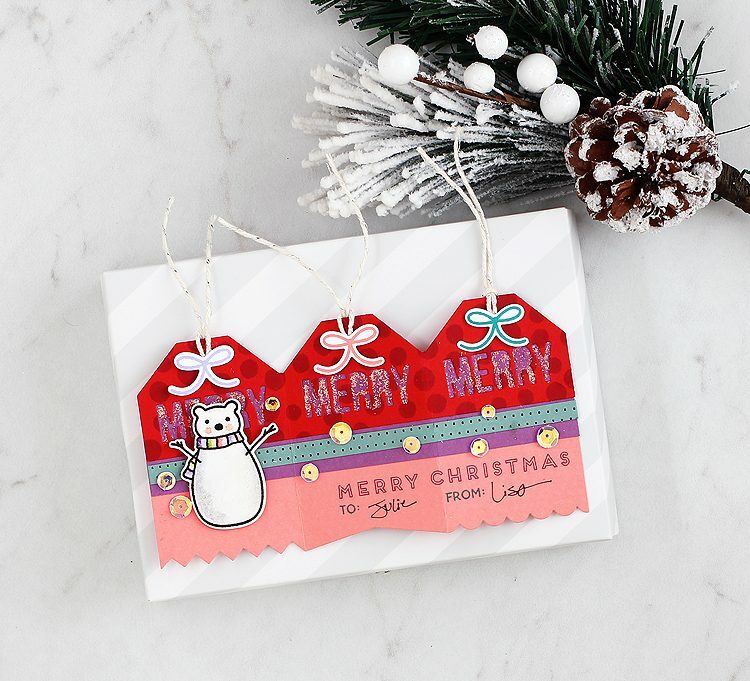 For this last set of tags I started out by cutting a Concertina Tag out of light purple cardstock and then I stamped all over it with the outline tree from the Modern Christmas set using soft lilac ink. I think it kinda looks like woodgrain! Then I layered leftover strips of tags across the whole purple Concertina Tag and cut it along the score line so I’d have 3 tags. 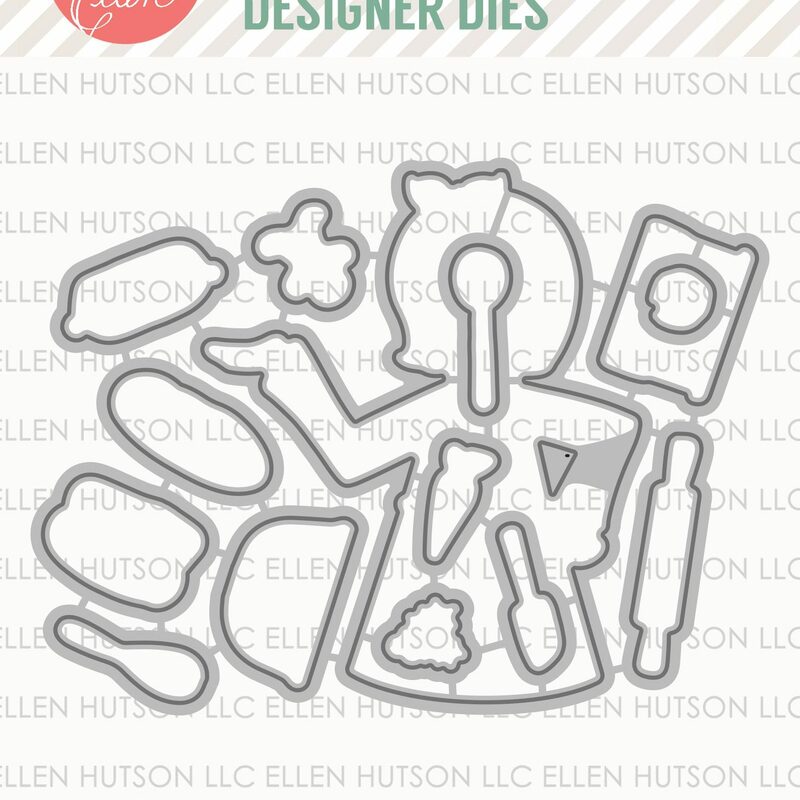 I die cut the “NO PEEKING” that comes in the die set out of one of ’em and then adhered the “NO” over top of another using foam dots — love how it really pops! Then I cut the “NO PEEKING” out of a pink scrap, and glued the “PEEKING” under the striped “NO” to finish it off. I couldn’t let that negative shape go to waste, and adhered it over top of a second tag. Then for both of them, I stamped a trio of holly leaves from the Modern Christmas stamp set, die cut them with the matching dies and added them to the top, along with a red circle from the Concertina Tag set. I added some dimension to the holly by adding the main vein of each leaf with a line of glitter — because by now you know me and glitter! Ha! 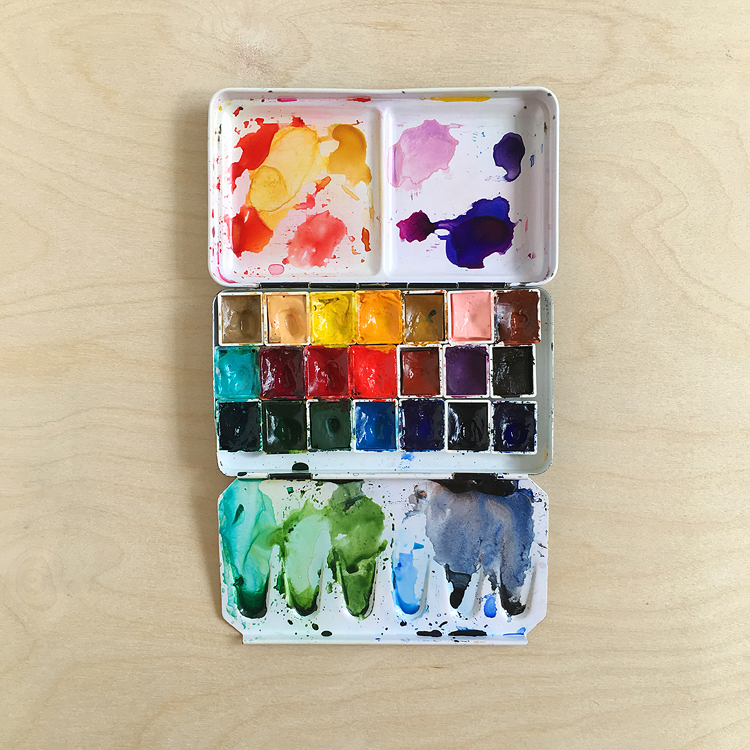 Your next stop on the hop is the super talented Audrey Tokach — I can’t wait to see what she’s made! 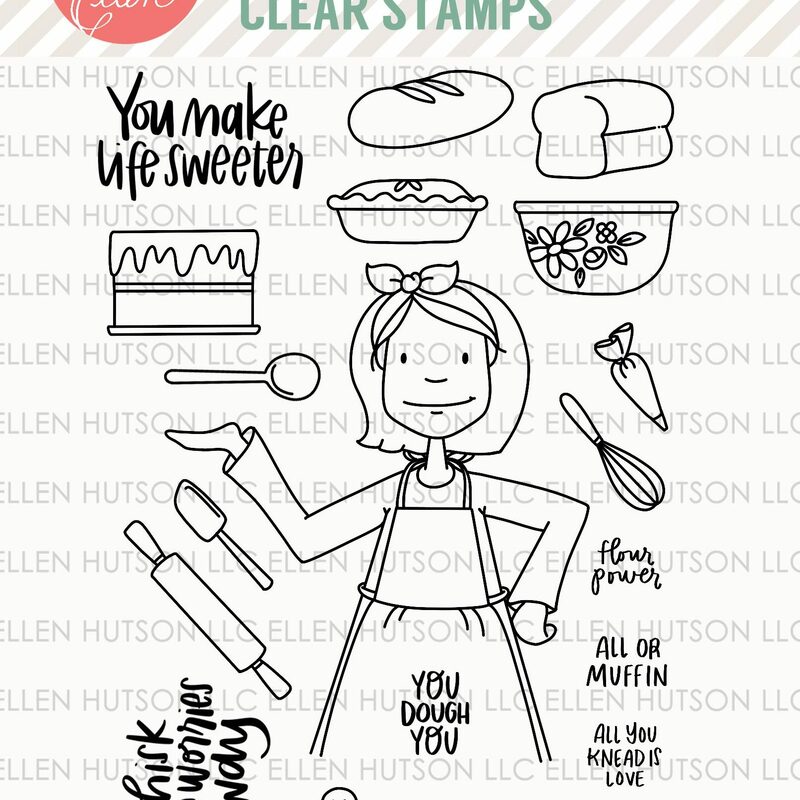 If you are just now joining us or come across any broken links you can head on back to the start over at Ellen Hutson. Here’s the full hop list for today — come back and join us for more fun the rest of the week! Here you’ll find the main supplies that I used for these projects. Note that these are affiliate links, so if you use a link to make a purchase I’ll receive a small commission at no charge to you. Diamond Stickles – I almost can’t make a Christmas project without these! I love the No Peeking ones too!!! I didn’t realize they were connected; that does make for some interesting possibilities!! 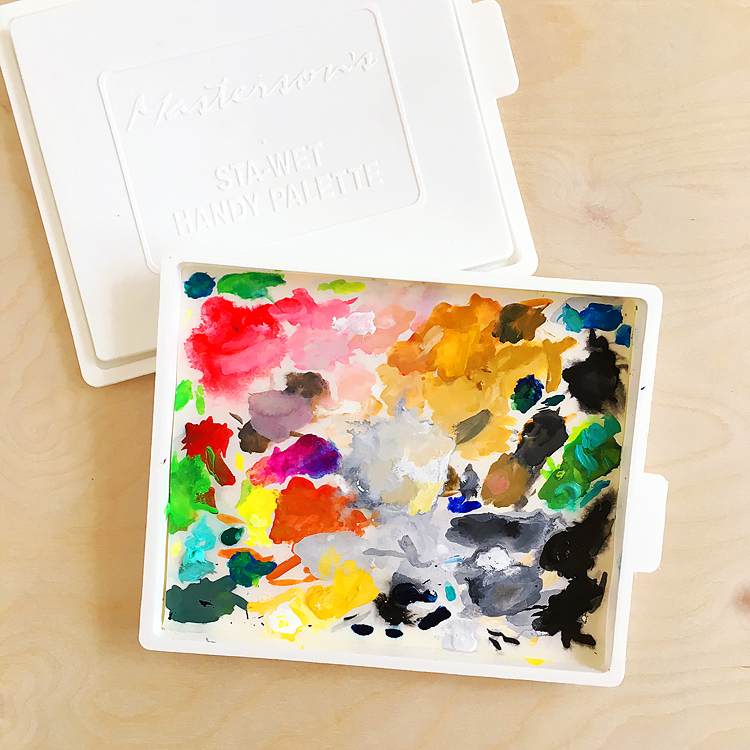 Love the color palettes ! So bright and fun!! Awesome inspiration-I have to have the concertina die. It’s brilliant.